Most of our family Google Services are tied to our family domain and Google Apps. That doesn't work for Google Voice though, so I had to create "true" Google accounts for each family member with a GV number. I used our Google Apps emails as the user name. Turns out, this has an interesting side-effect. Google binds calendars to a user name, so there's a calendar for emily@our_family_domain in Google Apps. So, you might wonder, what happens if you go to calendar.google.com when logged in to the standard Google Account with the Google Apps email? 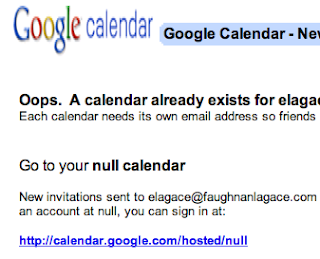 Get thee to the null calendar! Google struggles with their Google Apps/Google Account dichotomies.